Three little letters, one big idea. CRM promises to change the way you acquire, retain and develop profitable customers. CRM can help you to improve your key sales processes, including lead management, opportunity management, forecasting, upselling and cross-selling. But how much time can you afford to invest in selecting CRM? And how should you choose between systems? 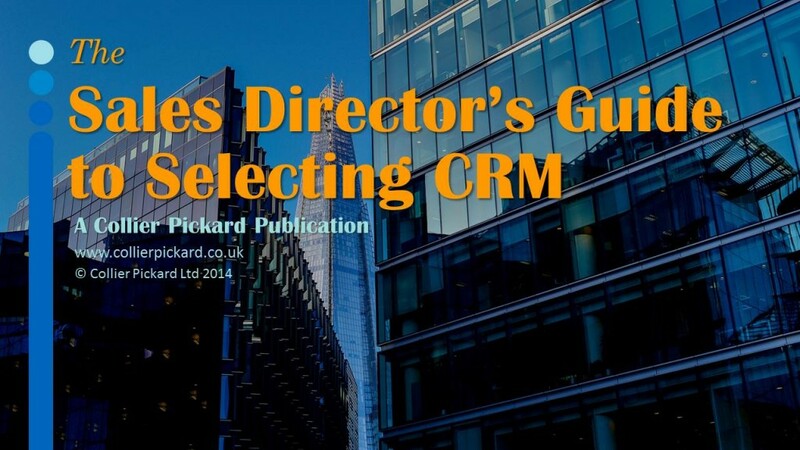 Read The Sales Director’s Guide to Selecting CRM today and get independent advice on selecting the right CRM software to meet your needs. Not sure if The Sales Director’s Guide to Selecting CRM is for you? The team here at Collier Pickard are constantly working to provide expert and independent advice to help you with your CRM project. Whether you’re just starting out, looking to make a change, or get an existing system back into shape we’ll have some resources for you! Check out our CRM Resource Centre for a complete list of our eBooks, videos and articles, or get in touch with our team today to arrange a free consultation with one of our consultants and discuss your unique needs! The team of sales and marketing professionals, customer service specialists, solutions architects, technology consultants and project managers at Collier Pickard has a wealth of experience in CRM dating back to the early 1990s. As independent CRM experts we’re here to make sure you find the right approach to CRM for your organisation. All you’ll get from us is independent, experienced advice on selecting, implementing, developing and maintaining a successful CRM system for your business.